The Na Pali Coast can be experienced a multitude of ways, none of which are with your car. That’s always a bonus for me. 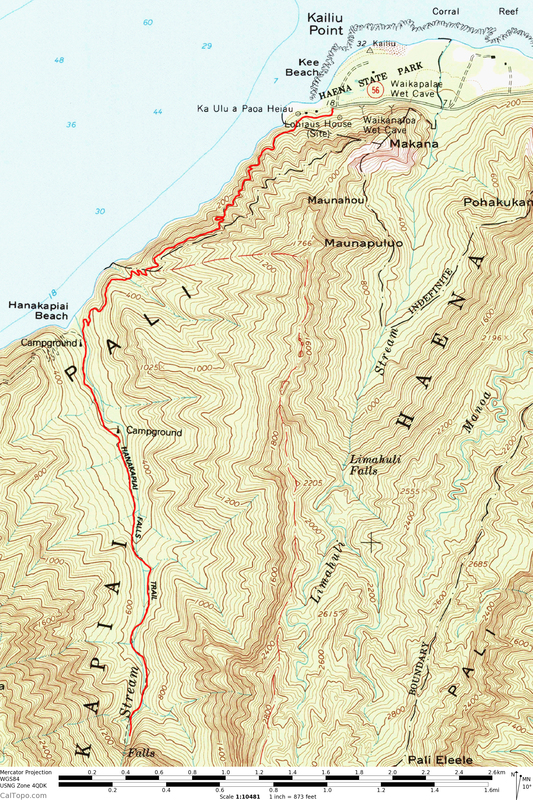 The easiest way to do it is to just hike the Kalalau Trail, which covers 11 miles of the rugged coastline. A backpacker’s permit is required to go past the 6 mile marker, but that still leaves a few amazing day hikes left on the table. On our recent trip to Kauai, we chose the classic 8 mile round trip to Hanakapiai Falls. The hike provides a great balance between coastal hiking with ocean views and lush jungle hiking, both of which are hard to find anywhere else. The trail starts at Kee Beach at the end of the road on Kauai’s north shore, and for the first mile it ascends up about 400 feet over a steady, moderate slope. Conditions here are often pretty muddy, which can make some of the steeper sections a bit precarious. Once the trail plateaus along the coastline, jaw dropping ocean views open up for the majority of the stretch to Hanakaiai Beach. It doesn’t get any better than this. Once the trail arrives at the beach, it crosses Hanakapiai river, which can be a dangerous crossing if you get caught on the wrong side after a heavy downpour. During the summer months, Hanakapiai Beach is close to the perfect beach. The two mile hike to reach it is enough of a barrier to eschew any big crowds, the beautiful Na Pali Coastline provides a breathtaking backdrop, and the river coming down from the canyon flows right onto the beach as a constant source of fresh water. I know this from my previous trip to the beach many years back, but in our case on this hike, we were at the beach during the middle of winter and the inviting sandy shore was overtaken by a violent surf that is likely to kill most people who dare swim in it. This beach is off limits in winter months. We knew that going in though, so off we went to go see the waterfall up the canyon. Unlike the hike to the beach, this was a stretch of trail that neither of us had ever done so we were eager to explore the area and reach the falls. Throughout our trip to Kauai, we couldn’t help but make constant Jurassic Park references, and no other place made me feel more inspired to do so than the bottom of this canyon. I half expected to see a brontosaurus head pop up at any moment. Those open views are short lived as the trail quickly moves into a more dense tropical environment. The jungle hiking here is a nice change of pace from the coastal vibe of the Kalalau Trail, or any other hike I’ve done for that matter. There aren’t many trails that are comparable to this within the United States. The trail crosses the river four times as it heads up to the falls. The river crossings are not trivial. Even in mild settings, it is a challenge to stay dry while crossing. The two mile stretch to the falls is unmaintained, and generally fairly narrow and muddy. Fortunately, it remains easy to follow, and soon enough, views of the waterfall open up to help navigate and inspire your way to the end. The effort feels well worth it once you reach the falls. Vertical cliffs surround you while the sound and mist of the waterfall pounding down from a couple hundred feet fill the area in between. On our way back, the view looking down the Na Pali Coast was remarkably different. The afternoon light cast much of it in shadow. The dark green jungle reflected virtually no light or color causing the scene to resemble a black and white photo. I just went with it for this one. We did get one nice surprise facing the other direction though. A rainbow appeared on the horizon, and lasted for quite awhile as we retraced our steps back along the coastline. I imagine that’s just part of the Hawaii hiking experience. We saw rainbows frequently on this trip, so by this point we weren’t even that surprised by our amazingly good fortune. Kauai and the Na Pali Coast have a way of doing that to you. The trail ends back at Kee Beach, a nice scenic spot that doubles as the best trailhead ever. Pack a cooler and hit the beach for the perfect post hike cool down. Beautiful photos. It looks absolutely spectacular and well worth documenting. Thanks for sharing. Makes me think of Jurassic Park…the movie. Well done. I hope SoCal gets some much needed rain soon! Wow. I’ve been wanting to go to Kauai and specifically do this hike. Thanks for the trail writeup and amazing photos. And pertinent info…like inaccessibility of that beach in winter. I’ve been curious about which beaches to hit there and found it interesting that a number are unsafe for swimming, esp. in winter. Good to know! Your photos are so inviting , I would love to visit this area as well as the trails in California that you have featured. Thanks for sharing! Thanks Tri! Your site is making me want to go to the Tetons as well. If only they were dog friendly :). Aug 2014 we, too, just finished this hike. I loved showing the pictures to my daughter, who knew this hike would be longer than she liked. I am 58, and in “good gym condition” (6miles on ellipsometer, med high resistance, 2-4 times a week) but this hike was really hard on me. It is like walking up and down big steps for over half the hike, was dead by the end of the hike, really sore muscles for three days. so glad i went, we swam up to the waterfall. But I fear my strenuous hiking days are done. I hate getting old!